Because of booking issues, we had to change accommodations. It turns out that was a good thing as the new place was quite a bit nicer than the old place. And, since the restaurant at the old place was closed for repairs, car keys were required to eat in both cases, so any advantages of the old was supplanted by the new. Done deal; we travel light anyway, so moving was a breeze. After the clouds and fog of the previous day the morning broke bright and mostly clear. To the south, we could see an awesome waterfall on the mountain to our south. 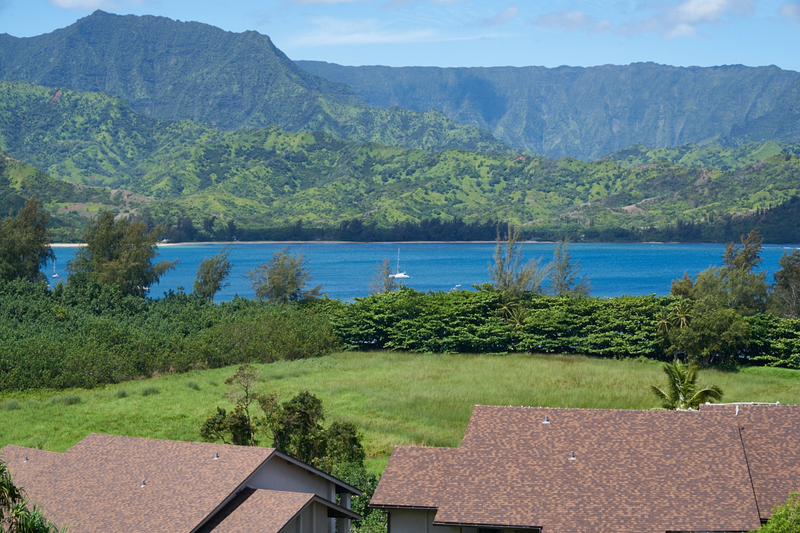 The view of Hanalei Bay was unobstructed by weather. There was a good-sized catamaran in the bay sitting at anchor. 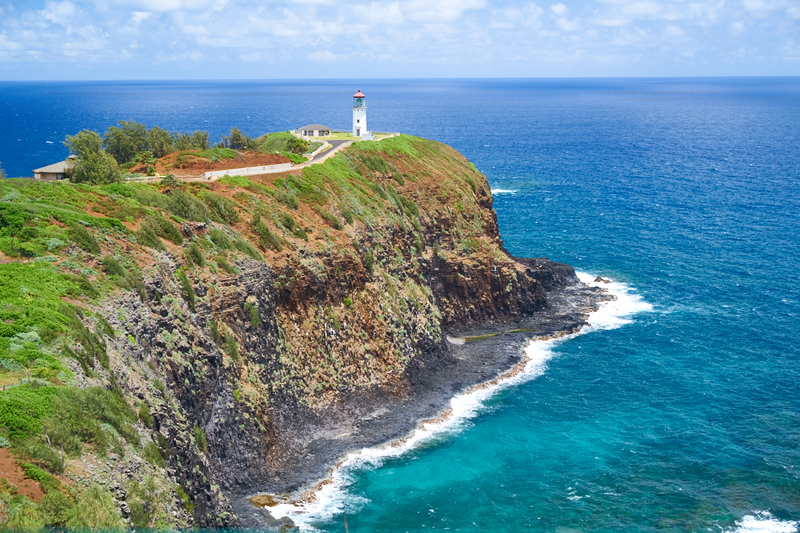 Kathleen wanted to see the Kilauea Lighthouse. We went there only to discover that they are closed on Sundays so we could only see it in the distance. 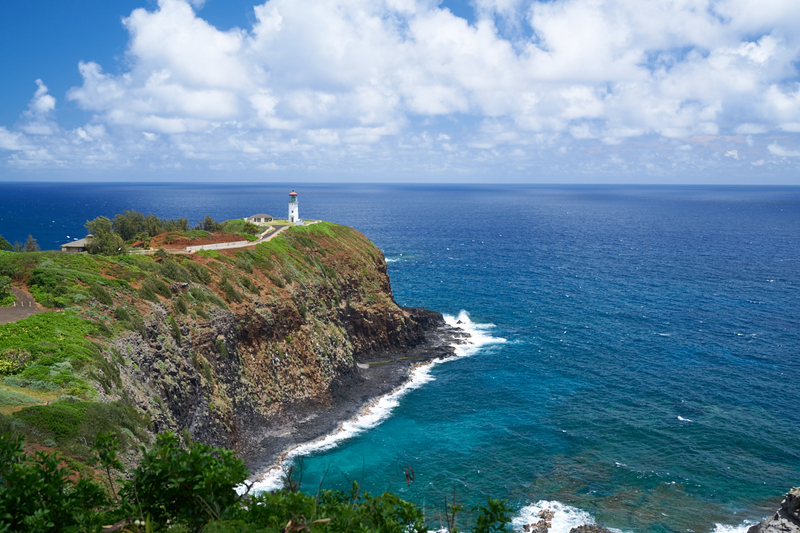 The lighthouse is situated on a large cliff out on a point. We retreated to a bistro down the road for a long lunch before heading to some of the local beaches. From the lighthouse, we followed a side road to a nearby beach. The winds were blowing quite hard, but the water was nice. Along the north shore to the east of our beach we could see the lighthouse. 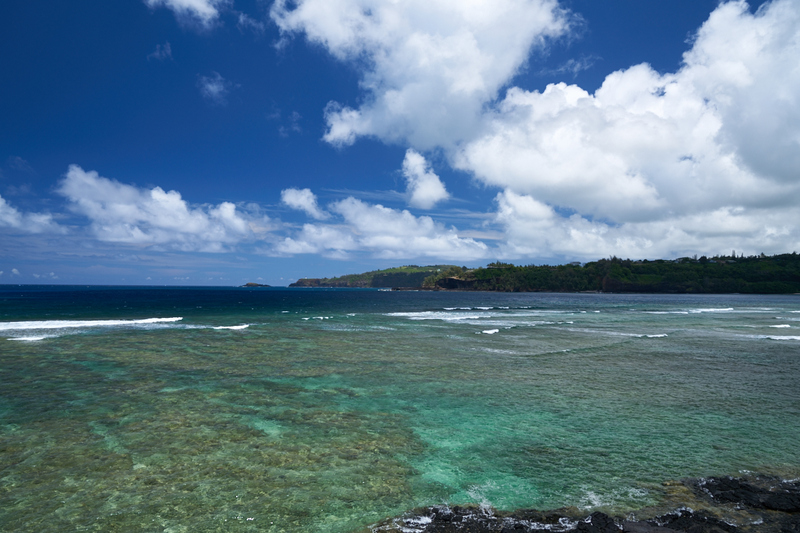 While a polarizing filter enhances sea color in photos, the real colors were almost as vivid as the photo above. The shallow waters resulted in an interesting mix of colors. Down the road a bit we encountered more pillow lava. 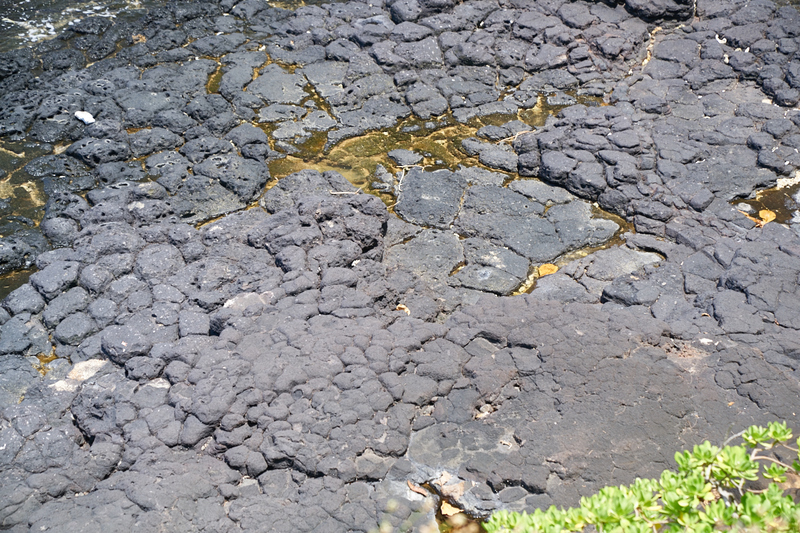 Pillow lava results from lava coming in contact with sea water and generates both round and hexagonal "blocks". We headed to the new hotel and did chores for the balance of the day. 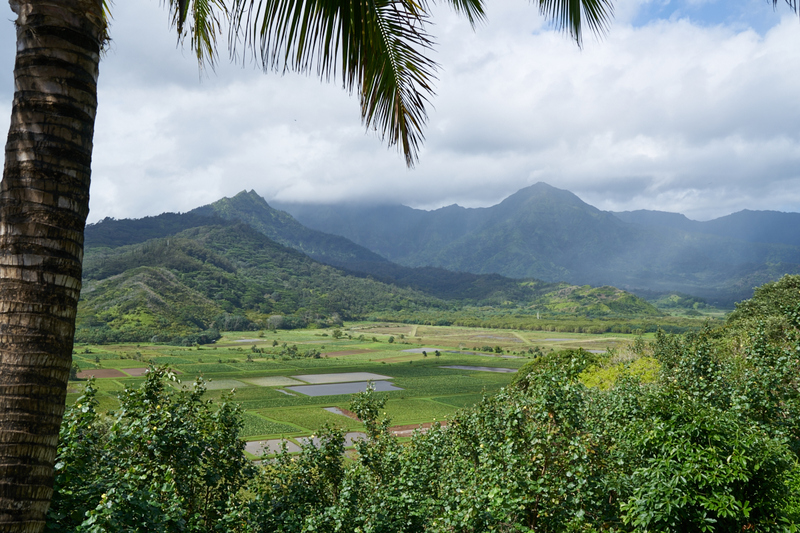 The next morning we headed to the small city of Hanalei for breakfast and our path took us past a viewpoint providing us a view of the Hanalei River Valley below. The rectangular fields are growing taro. The view was sufficiently striking to compel me to do a multi-shot panorama. The photo above spans about 120 degrees. 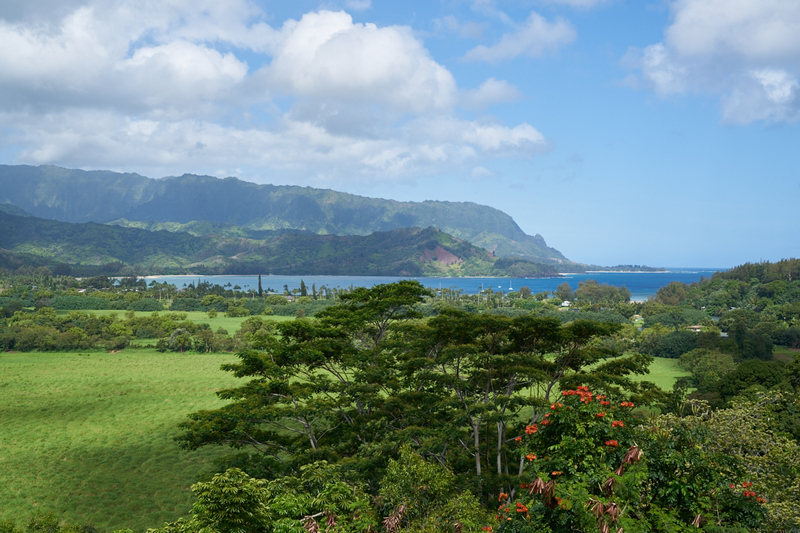 Another viewpoint further down the road toward Hanalei provided a view of the bay itself. 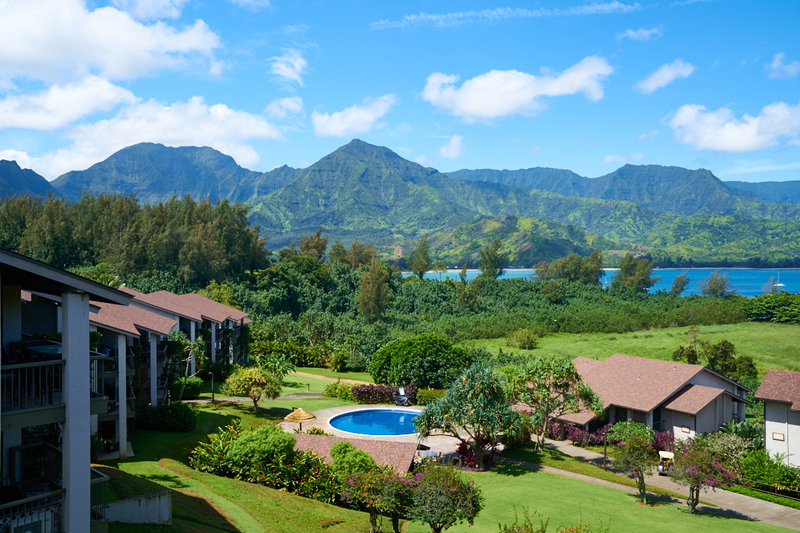 Hanalei Bay looked great in the morning sun. 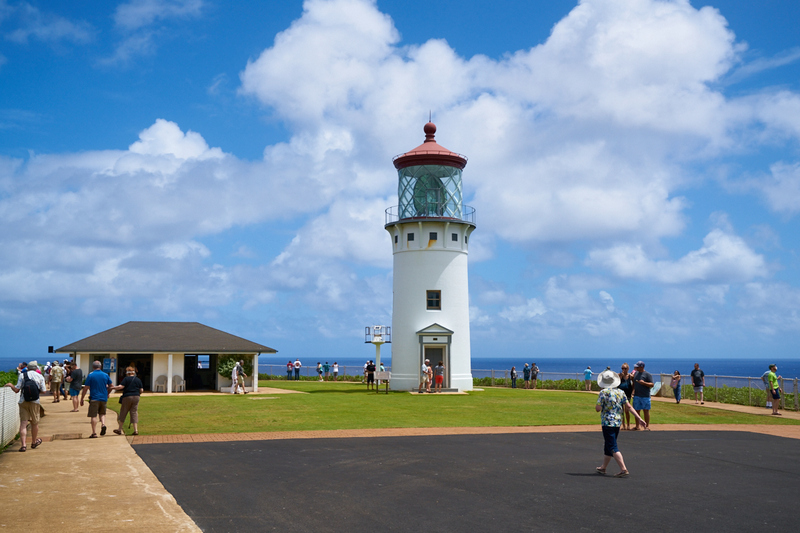 After breakfast, we headed to the Kilauea lighthouse again. From the access road we could see a narrow canyon that was carved by the pounding surf. 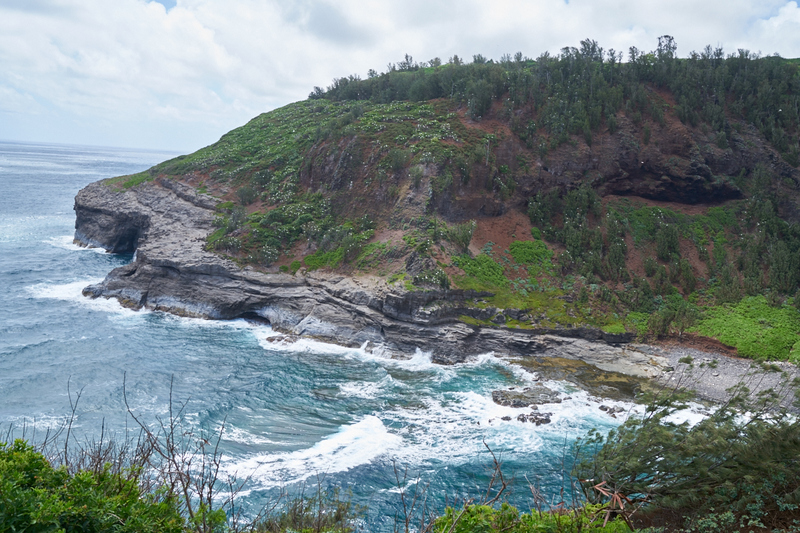 Note the two alcoves (AKA sea caves) carved by the force of the waves. 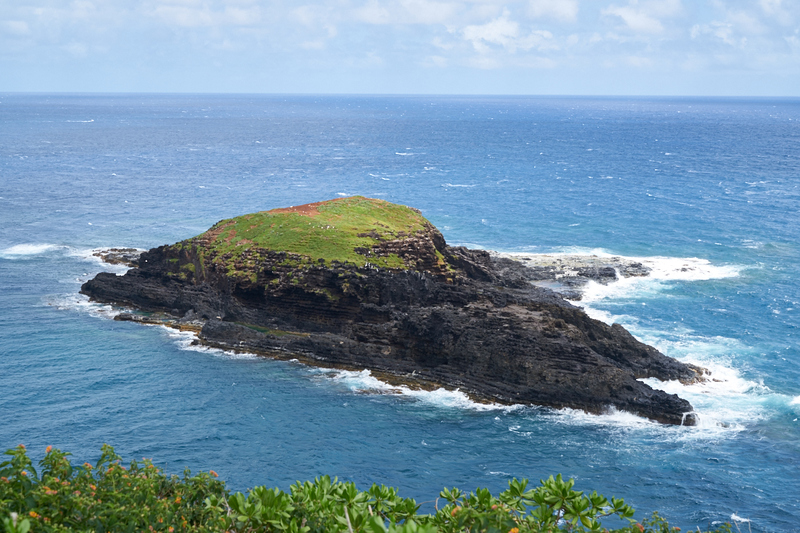 While this looks like a rodent burrow, it is really carved by sea birds who nest underground. 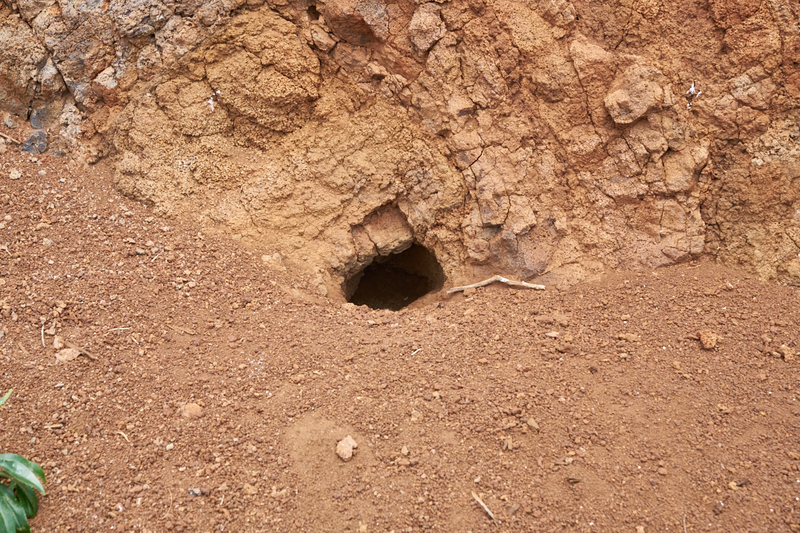 Several local species are burrow-nesters. The strong winds were producing significant waves and white caps further out in the bay. 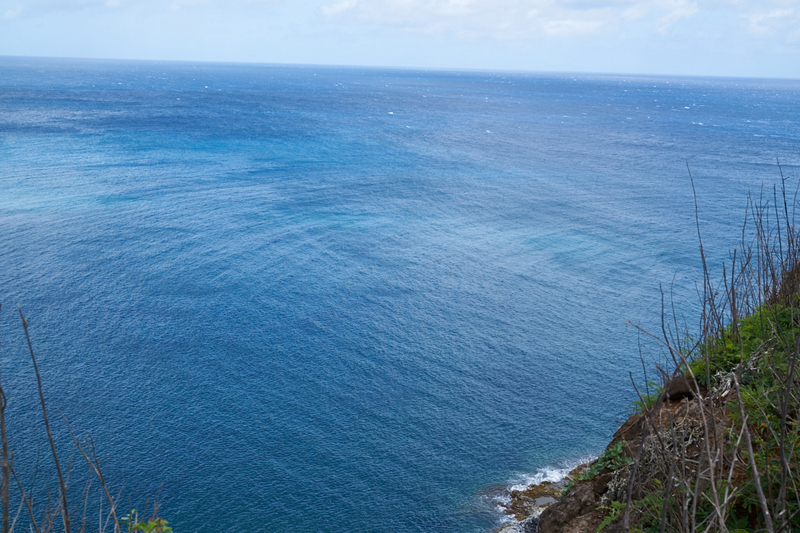 Note the reflections of the waves off the cliffs producing radiating patterns in the ocean's surface. Our National Park Pass got us onto the grounds for "free". Since I am sufficiently superannuated, I get the park pass for a reduced fee. Having seen many lighthouses, I never asked if it was still in service. 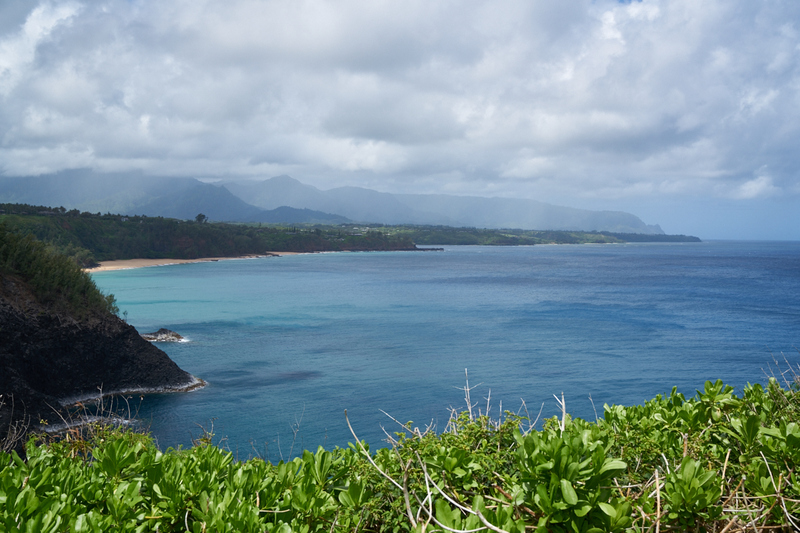 Looking to the west along the coastline we could see the distant headlands on the far side of Hanalei Bay. Just offshore past the end of point was a small island that was home to a large number of sea birds. Isolated from land predators, the birds breed in prolific peace. Kathleen wanted to see the botanical garden at Limahuli so we drove west on the coast road to land's end. Limahuli is in the last canyon before the ocean. The gardens do a great job of documenting the agricultural history of the area starting from about 200 A.D. 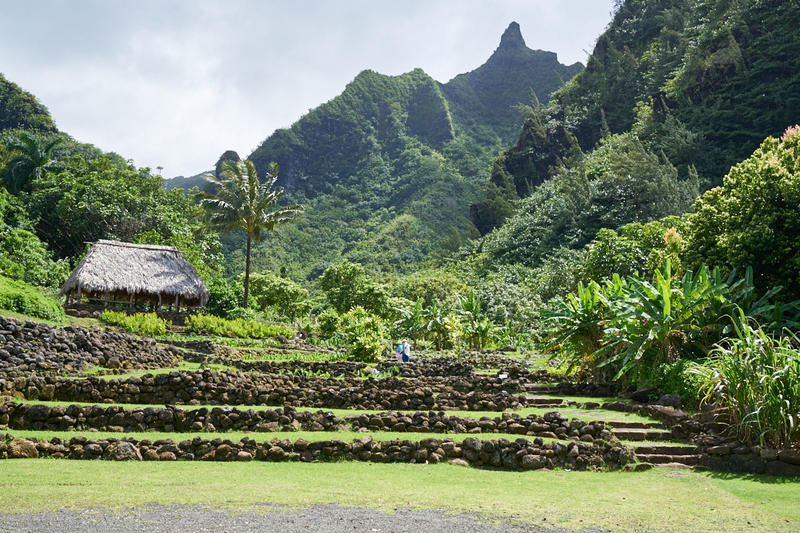 Most of the "food plants" and animals present on the island were imported by the Polynesians when they arrived. 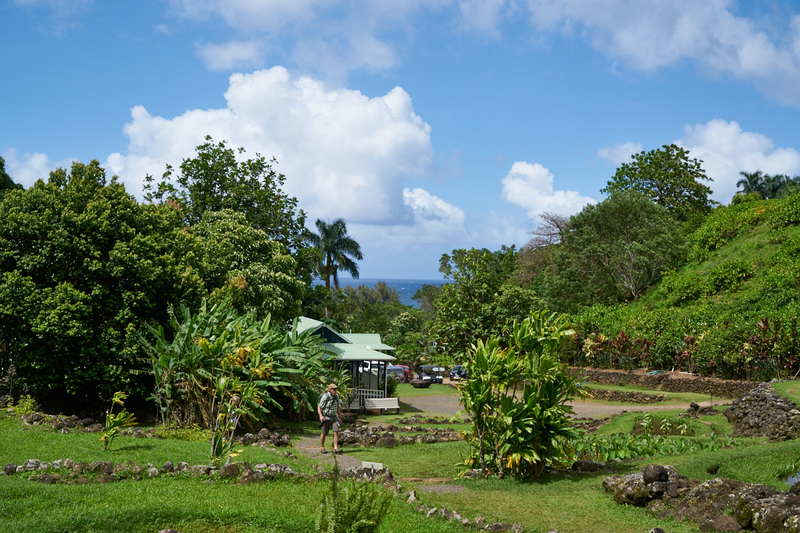 They brought the 27 most important plants and 4 animals to the island (fowl, pigs, rats and dogs). These terraces were built to provide flat ground next to the stream. They developed a gravity based irrigation system that serviced the terraces. 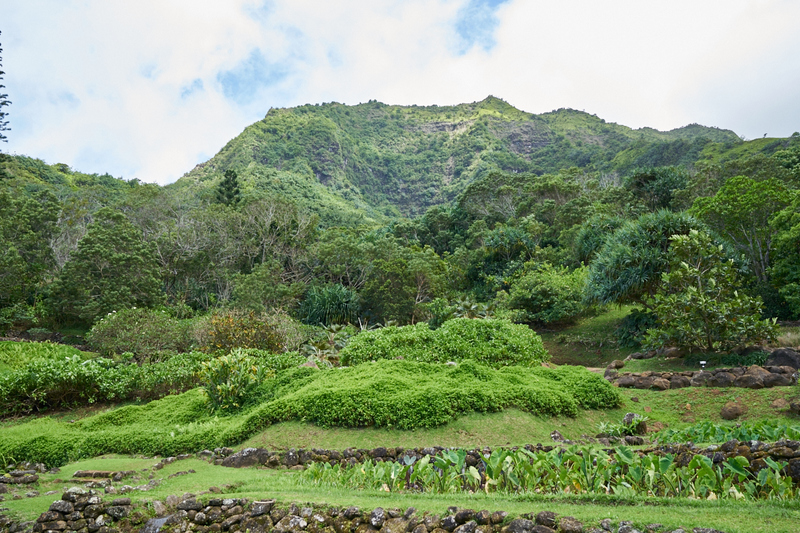 Situated in the flattest area of the steep canyon, the terraces provide growing area for Taro, one of the area' s most important starch plants. These people discovered that if the taro root is not sufficiently cooked it produces severe mouth and throat irritation. Only sufficient cooking removes the issue (and renders the taro root edible). 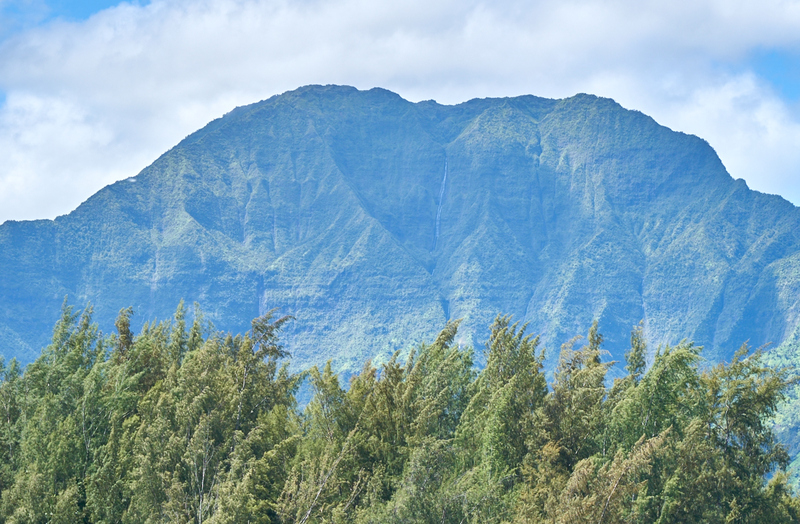 Taro leaves are visible in the foreground of the photo above. All parts of the taro plant are edible. 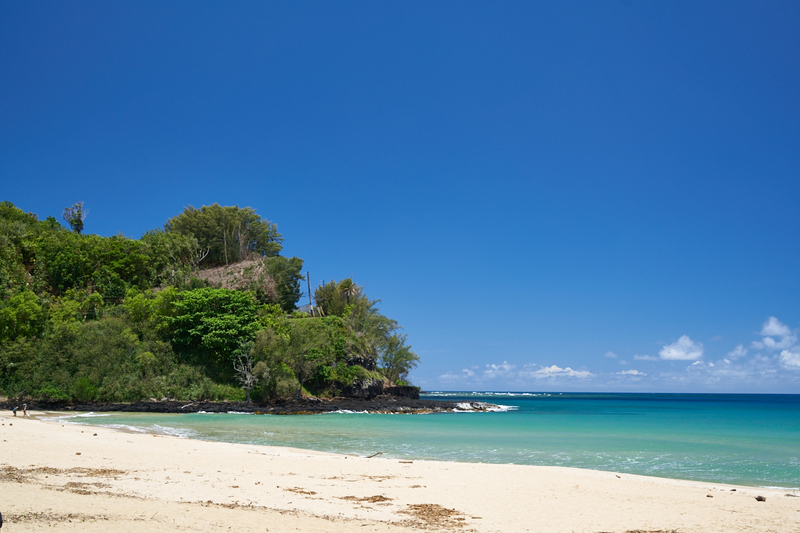 The base of Limahuli is at the shoreline. 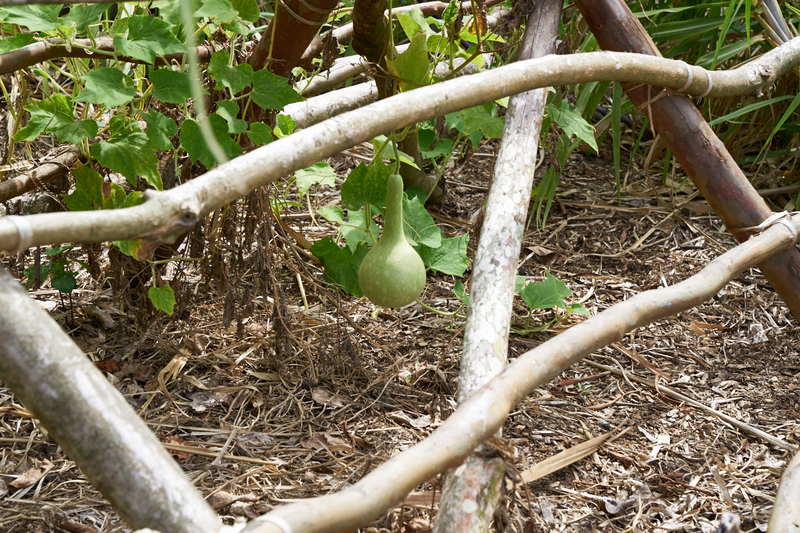 The bottle gourd was originally imported from South America, likely by the early Polynesians. 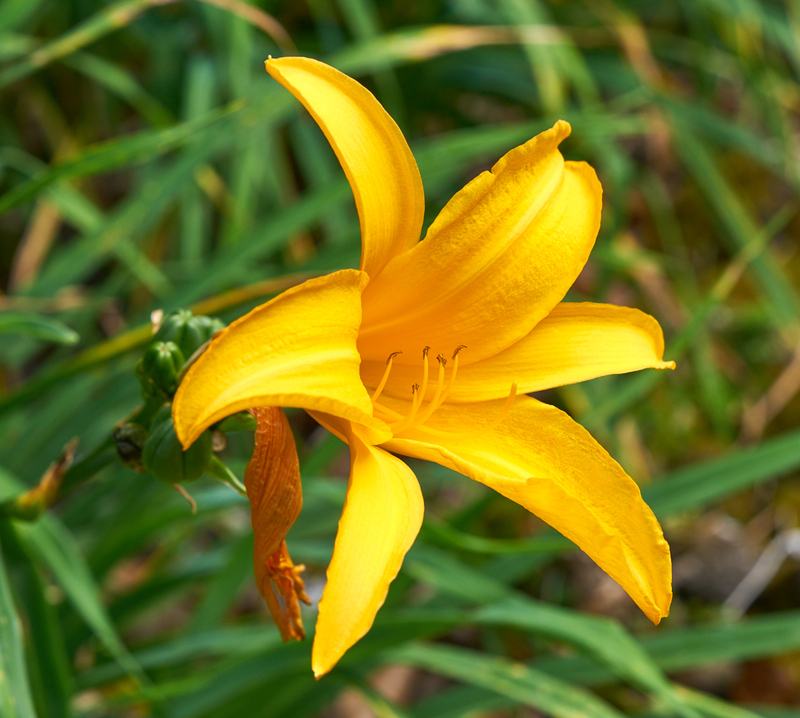 Some of the native flowers were in bloom. This was a particularly nice bloom. This odd plant got my attention because the leaves radiate from the main stem in a plane. 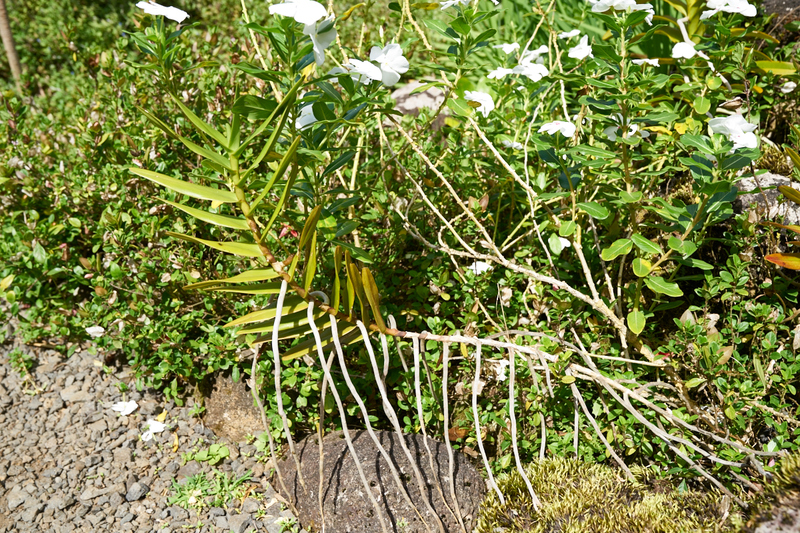 Note the roots projecting from the sides of the main stem. 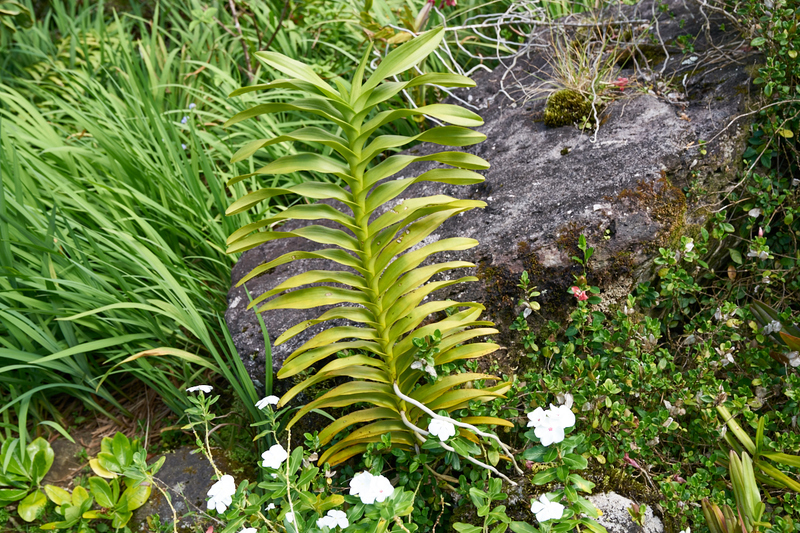 Next to the bigger plant was a small one of the same type where there are additional roots that grow down toward the ground. 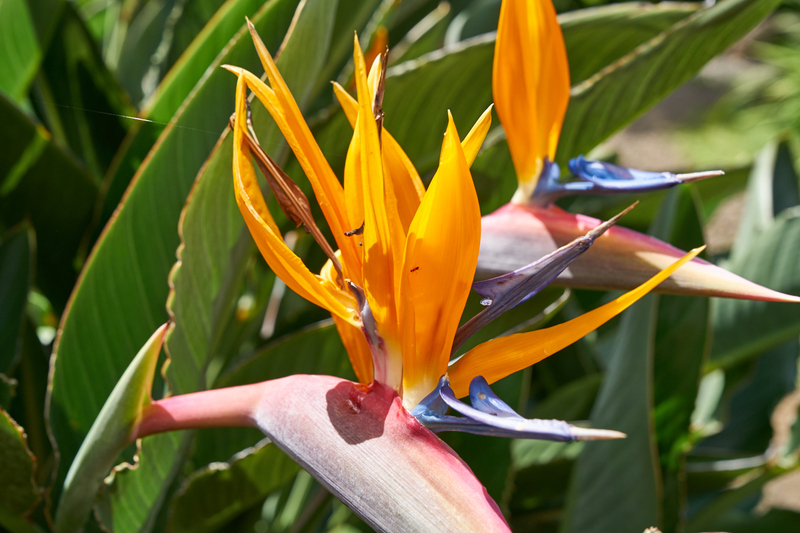 Classic Bird of Paradise which as it turns out was imported to the island. 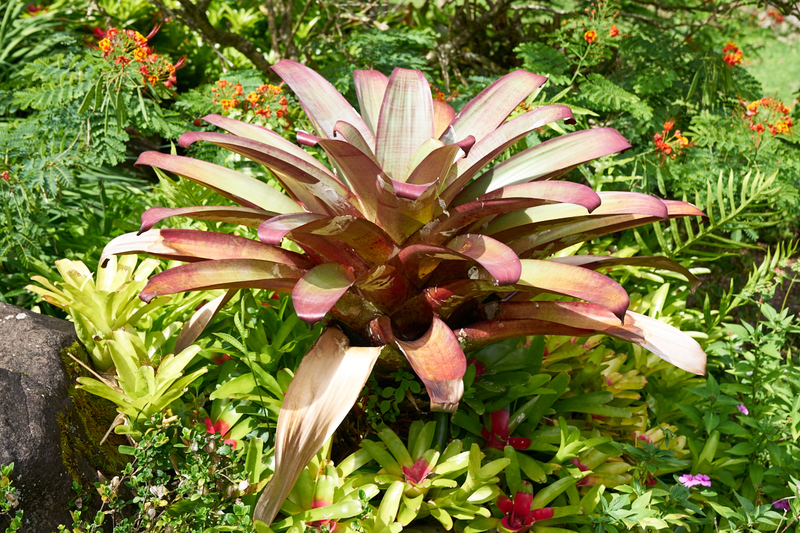 A huge bromeliad that holds water in the center of the leaf well. 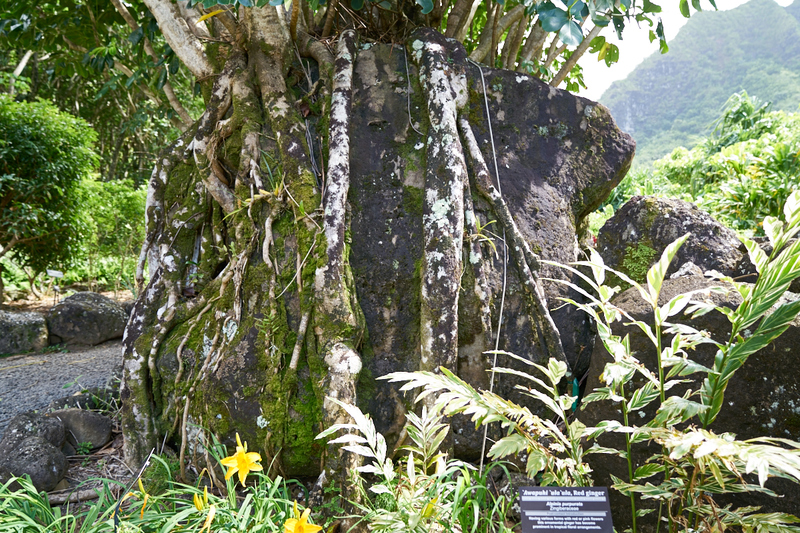 This plant completely covers this huge river boulder with roots. 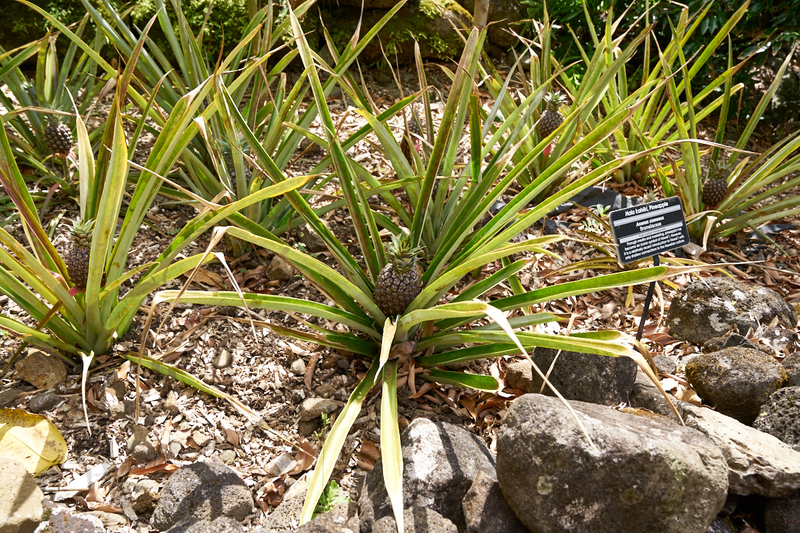 I had never seen a pineapple in the wild until now. 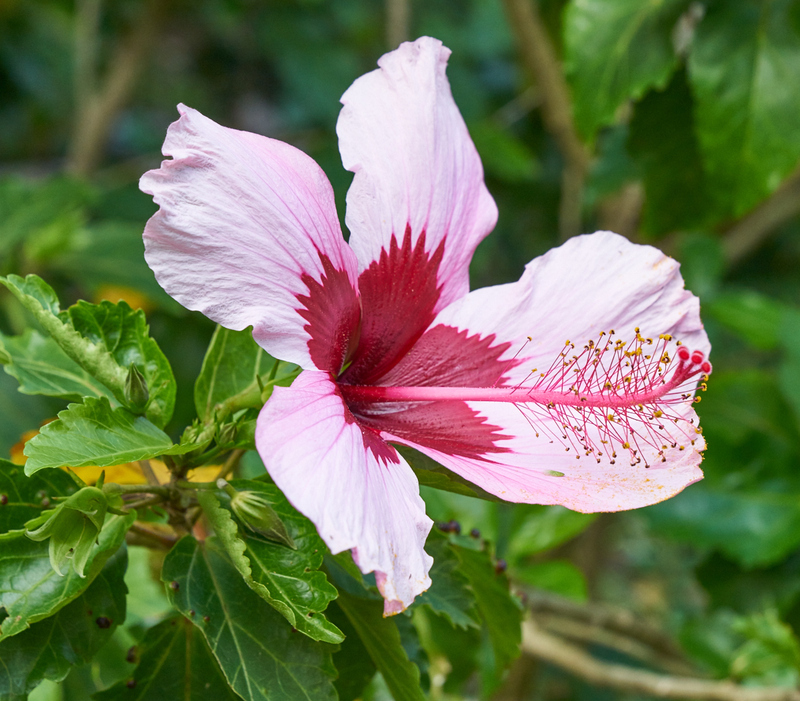 These are not a native plant and were imported to the island in the 1800s. 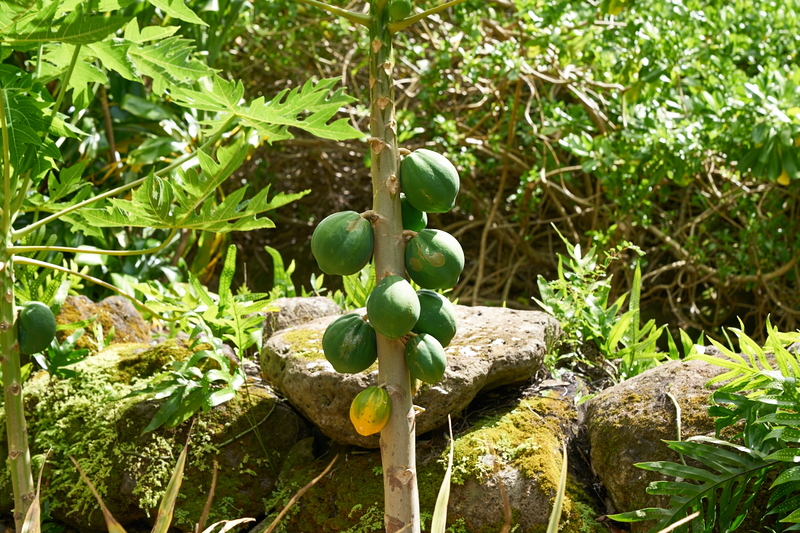 Papaya fruit on the stalk of the tree. 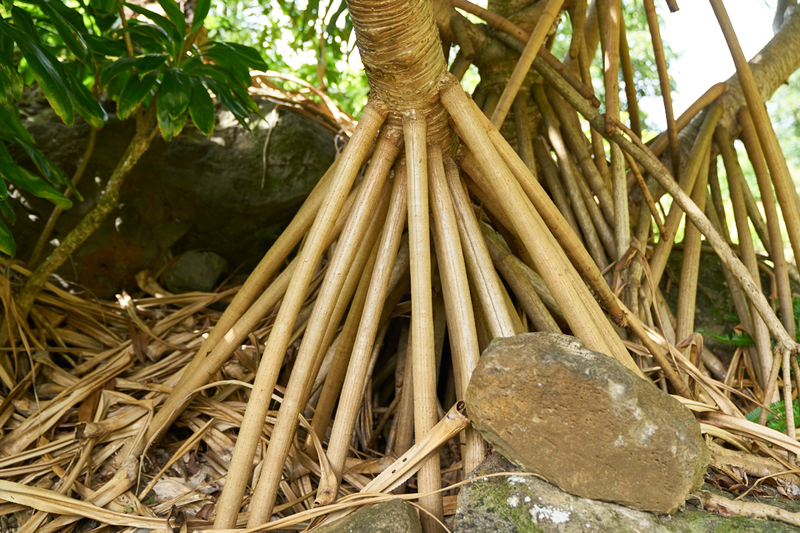 These down-growing roots form huge areas for wildlife to live. 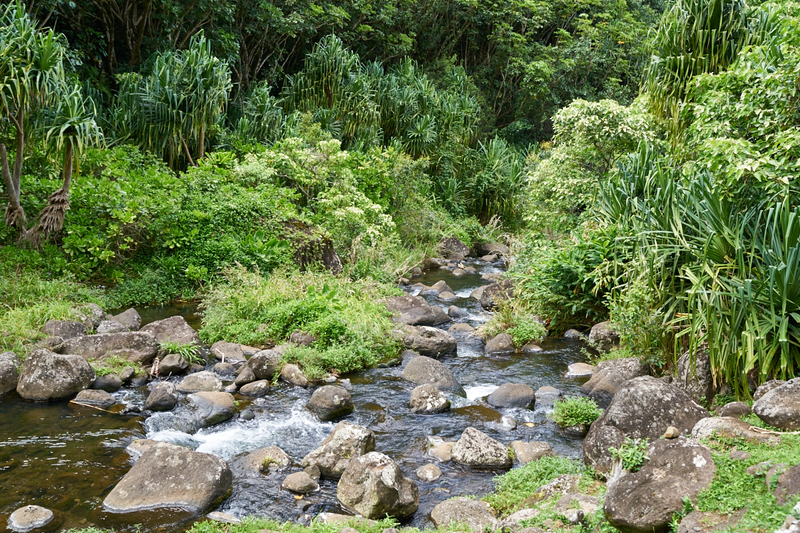 The stream that provided the constant water source for the area was rather large and flowed year around. Only a portion of the stream was diverted for agriculture and any remaining water was diverted back to the stream channel. 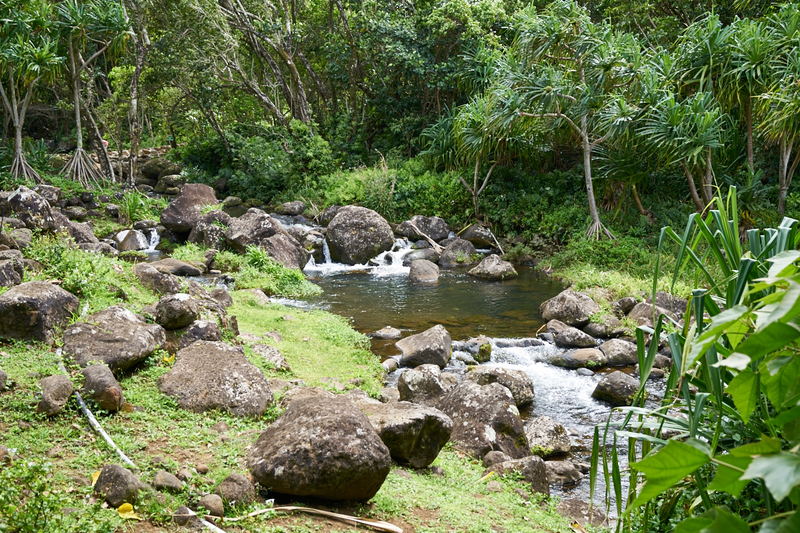 Further downstream the creek form several pools large enough to swim in. These pools were in the state park and drew a large number of tourists every day. 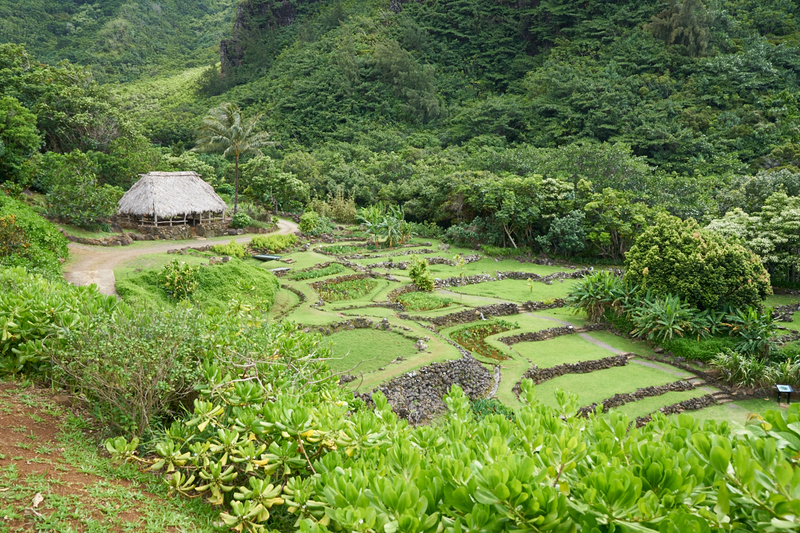 A final shot of Limahuli that clearly shows the terraces used for taro farming. After Limahuli, we continued west to Ke'e Beach at the end of the road to go swimming. It was misting most of the time we were there, but that was a good thing as it kept us from being totally sunburned. 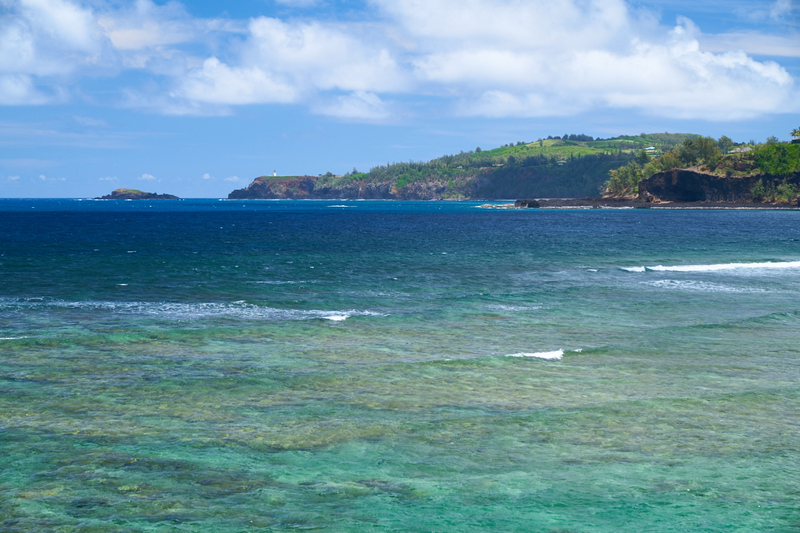 Tomorrow we depart the north shore and head east to the Kapa'a area for a few days.